Steve Benen wrote in The Washington monthly; the first bill President Obama signed after taking office was the Lilly Ledbetter Fair Pay Act, which made it easier for women to seek justice for pay discrimination. At the time, Sens. Susan Collins (R-ME), Kay Bailey Hutchison (R-TX) and Olympia Snowe (R-ME) joined with Democrats to overcome strong Republican opposition to the bill. But today, every Republican senator voted against a motion to proceed on the Paycheck Fairness Act, a bill that "would further strengthen current laws against gender-based wage discrimination." Women earn barely three-quarters of what their male counterparts make for the same work, but Republicans have invented a number of ludicrous reasons for opposing equal pay legislation. For example, the Heritage Foundation has suggested that equal pay laws actually hurt women because businesses simply won't hire them if they are required to pay them fair wages. Sen. John McCain (R-AZ) has claimed that women would receive better compensation if they just had more "education and training." The final tally was 58 senators supporting the measure, and 41 opposing. Because our Senate is often ridiculous, 41 trumps 58. What's more, note that this was only a vote on the motion to proceed. In other words, opponents didn't just disagree with the proposal, they filibustered a measure that would have let the Senate debate the idea. And what did those opponents have in common? Looking at the roll call, every Republican in the chamber voted to kill the Paycheck Fairness Act, while every Democratic except one supported it. The lone exception was, of course, Ben Nelson. "I am deeply disappointed that a minority of Senators have prevented the Paycheck Fairness Act from finally being brought up for a debate and receiving a vote. This bill passed in the House almost two years ago; today, it had 58 votes to move forward, the support of the majority of Senate, and the support of the majority of Americans. As we emerge from one of the worst recessions in history, this bill would ensure that American women and their families aren’t bringing home smaller paychecks because of discrimination. It also helps businesses that pay equal wages as they struggle to compete against discriminatory competition. But a partisan minority of Senators blocked this common sense law. Despite today’s vote, my Administration will continue to fight for a woman’s right to equal pay for equal work." This from a Senate with 41 Republicans -- next year it will have 47. I wonder how female Republican Senators like Sens. Susan Collins (R-ME), Kay Bailey Hutchison (R-TX), and Olympia Snowe (R-ME) can look at themselves in a mirror without wincing. What could they possibly tell their daughters, sisters, mothers, and female constituents to justify this behavior. Perhaps female Senators should take a 25% pay cut in solidarity with the Republican position, this would also reduce government spending, consistent with another policy close to the hearts of the GOP. 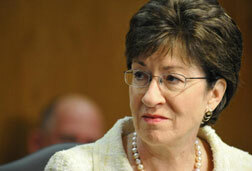 Senator Susan Collins (R-Maine), said in a September 22, 2010 New York Times Op-Ed; the Paycheck Fairness Act would “lead to excessive litigation on to the small-business community, it would hold employers liable for the “lingering effects of past discrimination” — “pay disparities” that have been “spread and perpetuated through commerce.” thus endangering jobs. Senator Collins also said the proposed law "overlooks mountains of research showing that discrimination plays little role in pay disparities between men and women, and it threatens to impose onerous requirements on employers to correct gaps over which they have little control." Other Republicans said that the fact that the bill would have limited employers’ basis for paying different wages was problematic. Republicans, according to a position paper by Romina Boccia of Independent Women's Forum complain the bill would unfairly burden employers with more regulations and paperwork, vastly expand the role of government in employers' compensation decisions, and discourage flexible working arrangements. And of course, there was the “trial lawyers will love this!” contingent, who suggest the bill would expose employers to far greater liability and potentially frivolous lawsuits. "Okay, but people are subject to laws concerning their actions far more restrictive then those concerning businesses. In point of fact we have laws that make businesses separate from people - supposedly to protect the people but just as much to protect the business. We also hold people to a far higher social standard of moral behavior then we do for business. As to working elsewhere - why should employees have to work elsewhere to get equal pay for their work? Why should employees have to work elsewhere when their safety is concerned. Just because it is cheaper for a business to have no concerns about worker safety doesn't make it right to have the entire burden of the safety of their workplace fall on an inability to get people to work there. Look, I realize that I am painting business owners with a wide brush here. But believe it or not having laws that require the less moral and ethical business owner to meet the same standards as one who does feel that providing a safe workplace is important equalizes the playing field for the good owner. We should not be encouraging the race to the bottom. We should in fact be making such behavior unacceptable to owning and operating a business in America. How can a Mom and Pop, who know their employees and won't cut their salaries until they have to compete with a Wal-Mart with massive tax breaks and no concerns about whether the employees' kids have enough to eat? They can't. We are now where being innovative and inventive is secondary to how cheap can we do this, and the best way to do this is to undercut employees. Our bottom line attitude toward business hurts everyone but a small section of the population in the long run. It kneecaps smaller businesses, it depresses wages, and tax bases, it encourages deterioration of our infrastructure, increase in personal and governmental debt, and actually long term undercuts their customer base. But hey, lets talk tobacco..."
I think it's become apparently clear that the republican votes during this transitional period are not to be taken seriously. We'll all have a front row seat to the GOP freak show come next year.